Introduction. Basic Properties of Random Vectors. Normal Distribution Theory. Estimation. Hypothesis Testing. Multivariate Regression Analysis. Econometrics. Principal Component Analysis. Factor Analysis. Canonical Correlation Analysis. Discriminant Analysis. 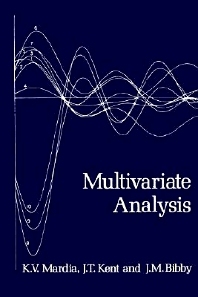 Multivariate Analysis of Variance. Cluster Analysis. Multidimensional Scaling. Directional Data. Matrix Algebra. Univariate Statistics. Appendix. References. List of Main Notations. Subject Index. Author Index. Multivariate Analysis deals with observations on more than one variable where there is some inherent interdependence between the variables. With several texts already available in this area, one may very well enquire of the authors as to the need for yet another book. Most of the available books fall into two categories, either theoretical or data analytic. The present book not only combines the two approaches but it also has been guided by the need to give suitable matter for the beginner as well as illustrating some deeper aspects of the subject for the research worker. Practical examples are kept to the forefront and, wherever feasible, each technique is motivated by such an example. Undergraduate, and graduate students in mathematics and/or statistics.